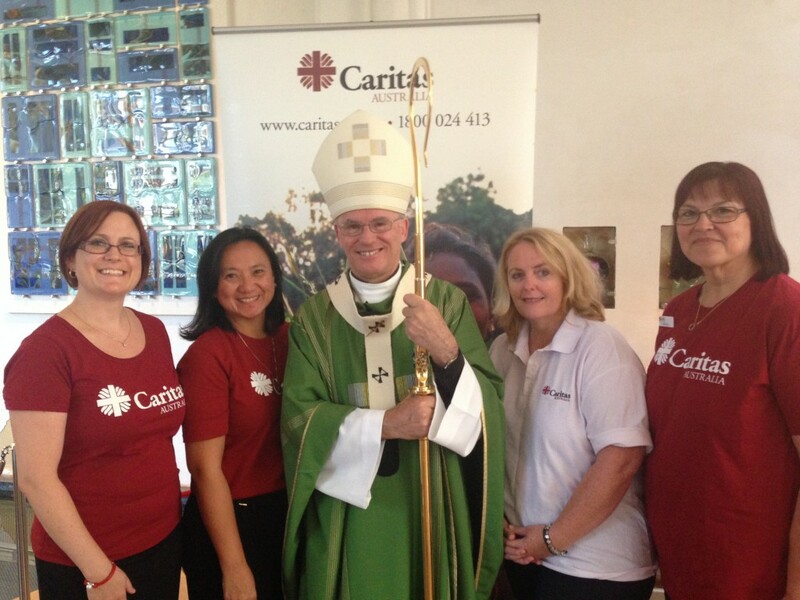 Focused on the theme Food for Life, Perth Archbishop Timothy Costelloe last Sunday launched the 2015 Caritas Australia Project Compassion appeal – one of Australia’s largest humanitarian fundraising and awareness-raising campaigns. The Mass at St Mary’s Cathedral on Sunday, 15 February was attended by Perth Lord Mayor Lisa Scaffidi as well as guests from Vasto, Perth’s Italian twin city, including Vasto Mayor, Luciano Antonio Lapenna. The Archbishop said that, through Caritas, the Church is seeking to throw a spotlight on global food issues. “Through the aid and development programs sponsored by Caritas, [we will] empower the world’s poorest people to establish sustainable food sources for life,” he said. The Archbishop went on to speak of how “Project Compassion is focused on giving people hope, and does so in a way that deeply respects the dignity of people’s right to self-determination”. He stated that “we are not really handing out charity” but, rather, that “we are helping people to live the lives God has created them to live: light of joy, lives of dignity, and lives of hope”. Quoting Project Compassion’s 2014 total fundraising of $11 million, the Archbishop invited the Catholic community to take home with them a Project Compassion gift box and suggested that families “make this a special part of your Lenten journey this year”. Each year, Project Compassion, which runs through the six weeks of Lent, brings hundreds of thousands of Australians together in solidarity with the world’s poor. Caritas Australia CEO, Paul O’Callaghan, said Project Compassion was an extraordinary, ongoing demonstration of the faith, love and generosity of caring supporters, all in the name of justice and peace. Last year, supporters, schools and parishes across Australia raised nearly $11 million to help the world’s poorest communities. “Project Compassion has transformed the lives of many of the most marginalised people around the world,” Mr O’Callaghan said. The theme for this year’s Project Compassion, Food for Life, aligns closely with the Caritas Internationalis global initiative of One human family, food for all, aimed at ending hunger by 2025. “Food is essential for all life and, while we may take it for granted in Australia, many of the world’s poorest people do not have a reliable food source, or enough money to buy food every day,” Mr O’Callaghan said. This year, Project Compassion focuses on the ways in which Caritas Australia is working with partners around the world to empower vulnerable people to establish sustainable food sources and develop income streams for life. “Without food, the rest of life is impossible to contemplate. How can you plan for the future or educate your children when you fear you will be hungry?” Mr O’Callaghan said. “I encourage you to be a part of Project Compassion this year. During Lent, Australians are invited to raise funds for Project Compassion in a variety of ways. This can be by direct donation, raising money through a range of events such as Caritas Ks which raises money by walking, running, cycling or swimming kilometres for compassion or by hosting a Fish Friday event where people eat small fish meals and make a donation. To donate to Project Compassion, or for fundraising ideas, go to www.caritas.org.au/projectcompassion or phone 1800 024 413.